Amidst all the pomp and circumstance at Tuesday’s opening of Parliament (Stortinget), it was the latter that grabbed most of the attention. 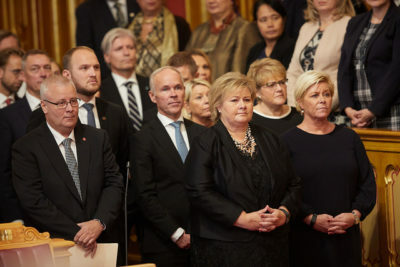 Lurking in the background was the sudden change of political circumstances in Norway, and new uncertainty over whether Prime Minister Erna Solberg’s Conservatives-led minority government will survive the autumn’s political storm ahead. It’s already been blowing up a gale, since the leader of Solberg’s critical support party in Parliament, the Christian Democrats, recommended switching sides to become part of a new government formed by the Labour Party. Knut Arild Hareide, who has always supported Solberg as prime minister, now proposes toppling her government by moving his party from its traditional position at center-right to join a socialist coalition at center-left. Hareide has been called, during the past week, everything from a “Judas” to a desperate politician more intent on position than policy. Solberg herself has mostly refrained comment on his alleged betrayal that also has deeply divided his own already-embattled party. While some Christian Democrats are already calling for Hareide’s resignation or leaving the party altogether, others are intrigued by the idea of a radical turn to the left in the hopes of a revival that will attract new voters. It’s all blown up to the new political storm that, as some commentators have written, has pulled the rug out from under the otherwise popular and seemingly solid Solberg. 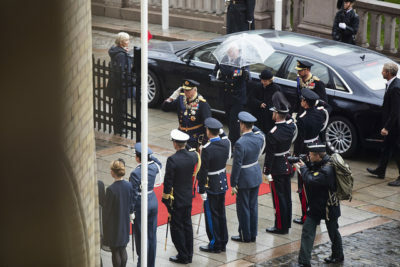 It was even raining outside when King Harald arrived at Parliament on Tuesday, accompanied by Queen Sonja and Crown Prince Haakon, to formally open its 163rd session. The mood was sombre and scripted, as usual, down to the last detail. The 81-year-old monarch performed his ceremonial duty of reading the government’s trontale, literally a speech from the throne that highlights the government’s year so far and outlines its program for the year ahead. For years he simply stood in front of the elaborate throne brought in for him and read aloud. This year he delivered the government’s address from the safety of a podium, and railings were set up on both sides of the riser where the royals sat, after King Harald famously stumbled and nearly fell two years ago. 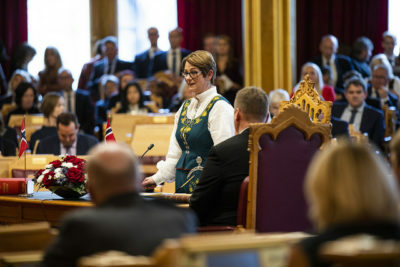 The opening of Parliament remains a festive occasion, with many of its elected members wearing traditional Norwegian costumes known as a bunad. It was also the first time that Tone Wilhelmsen Trøen of the Conservative Party presided since being elected as the Parliament’s new president earlier this year. She made her entrance just ahead of the traditional parade of top bureaucrats, the royals and then the government. 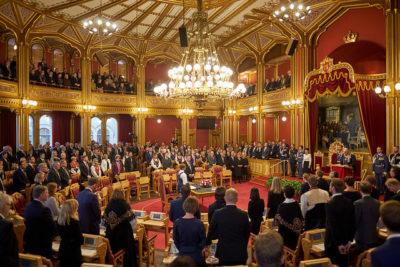 After all in attendance except the monarch sang a Norwegian version of “God Save the King,” Solberg handed her government’s address to the king. After he finished reading it aloud, the newest minister in Solberg’s government, Bård Hoksrud of the Progress Party, read the government’s own account of its priorities regarding such issues as job creation, climate, reducing social differences. integration, safety, defense, Brexit and saving the seas. After Trøen delivered her own address, it all ended with another joint singing of Norway’s national anthem. The gloves will come off from Wednesday, when there’s a traditional debate in Parliament over the government’s program. Finance Minister Siv Jensen of the Progress Party will present the government’s state budget proposal on Monday and then the political battles will begin. Hareide, meanwhile, will spend much of the next month trying to convince his divided party to try its luck forming a government with Labour and the Center Party. It would also be a minority coalition, with even few votes in Parliament (41.9 percent) than Solberg’s current coalition with Progress and the Liberals who collectively holds 44.6 percent. Hareide’s plan would make a new left-center coalition utterly dependent on the Socialist Left party (SV), already stung by not being included in it. If Hareide fails in his effort to switch sides, he may be toppled himself and new Christian Democrat leaders may accept Solberg’s longstanding invitation to join her coalition. Then she’ll survive the rest of her term that’s supposed to run until the fall of 2021. “There won’t be a government crisis if there’s no mood for it,” political commentator Arne Strand wrote in newspaper Dagsavisen over the weekend. If there is, Solberg’s opponents will need to find an issue to force a vote on lack of confidence in the government. Strand notes, however, that Labour’s leader Jonas Gahr Støre will gladly take over as prime minister if given the chance.